ic Kathe With an E: Happy Birthday Linda! One of the sweetest bloggers I've never had the pleasure to meet in real life is celebrating her birthday day! Linda blogs at Al A Carte. Through emails we have gotten to know each other and I just know, if we were to meet in real life we'd be the best of friends. A few months back, Linda was clearing out some of her stash and gifted me a lovely little teapot and a set of napkin rings. In honor of her special day I decided to create a vignette using these special gifts. 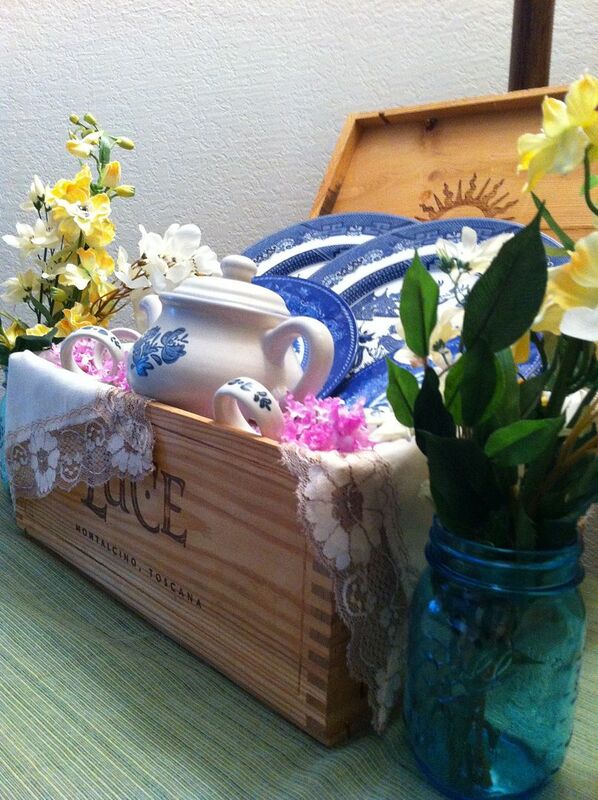 Using the blue in the teapot I gathered some of my favorite dishes and set them in my wine box that sits on Max's table. 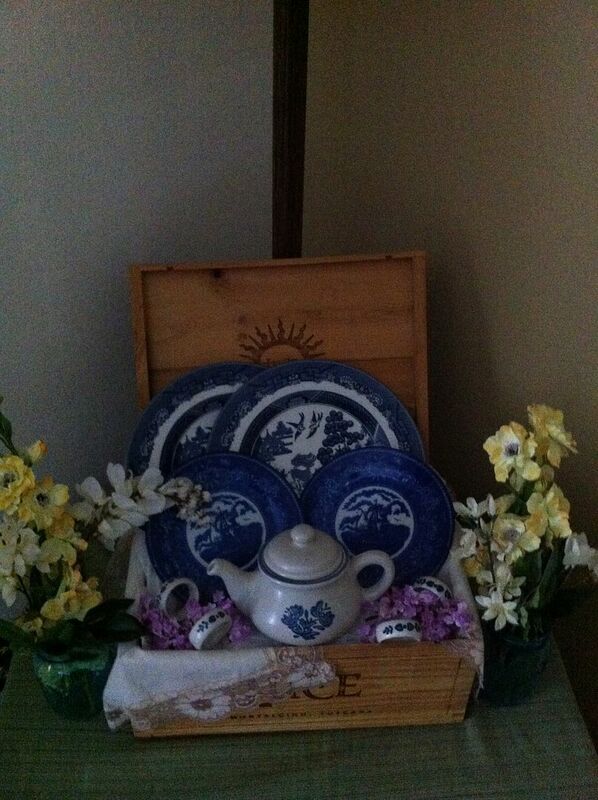 I placed the teapot front and center. Just like Linda, it is just the sweetest thing ever! I also set four of the napkin rings upon some of my favorite flowers, Lilacs. Due to a hard frost at the wrong time, mine didn't bloom well enough to use real, but faux works too. in blue Ball jars on each side of the wine box. I hope you like my little homage to your very special day Linda. Kathe you just made a good birthday even better! Thank you so much! 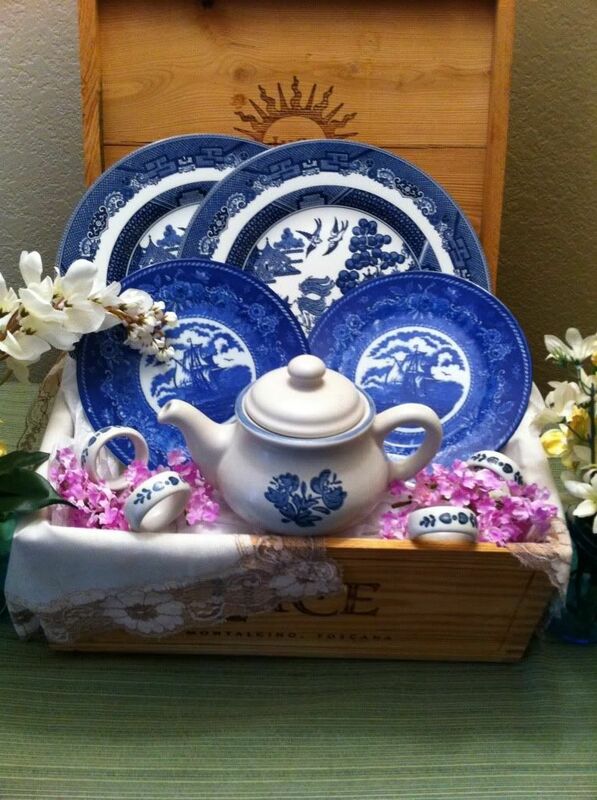 I'm so glad you like the teapot and napkin rings! 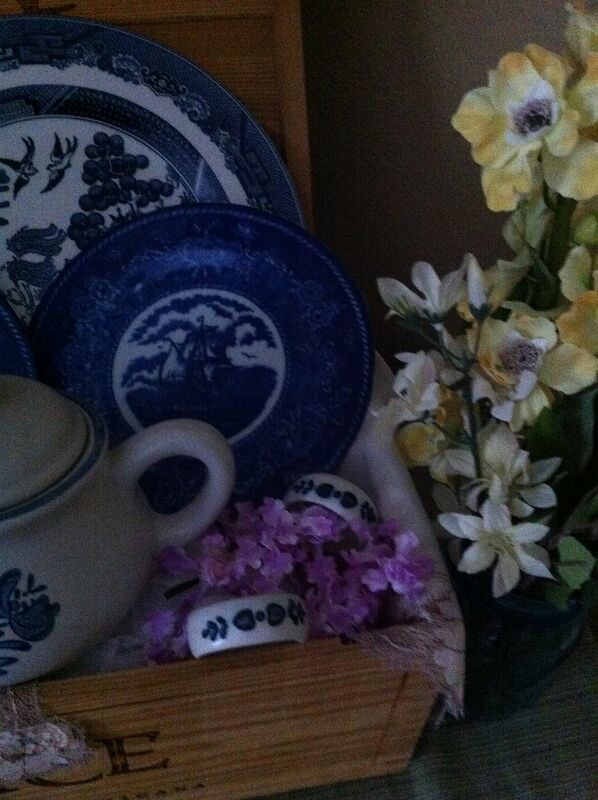 I love the blue and white vignette you did with them and those great plates. I too know that I am so glad we've met in blogland and become friends! Hi Kathe! This is so pretty and I LOVE those plates! Happy Birthday Linda! Awww :) This is the sweetest ever :) blog is most amazing place to friendship. The gift is so lovely!! What a great post and such a sweet gift. Hi Kathe, it is so sweet the way that we become friends with each other. That was so thoughtful of you and your friend to share with each other. Take care. I am a total dish freak and these are just so beautiful! 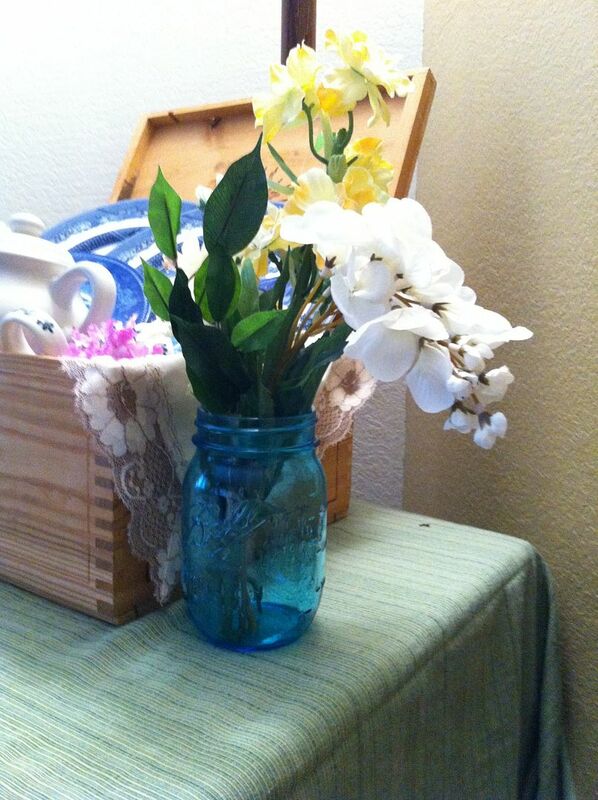 I love how you displayed them, so pretty...and what a lovely gesture made for a friend. In my opinion, you are both lucky ladies! Enjoy the evening! It looks beautiful. 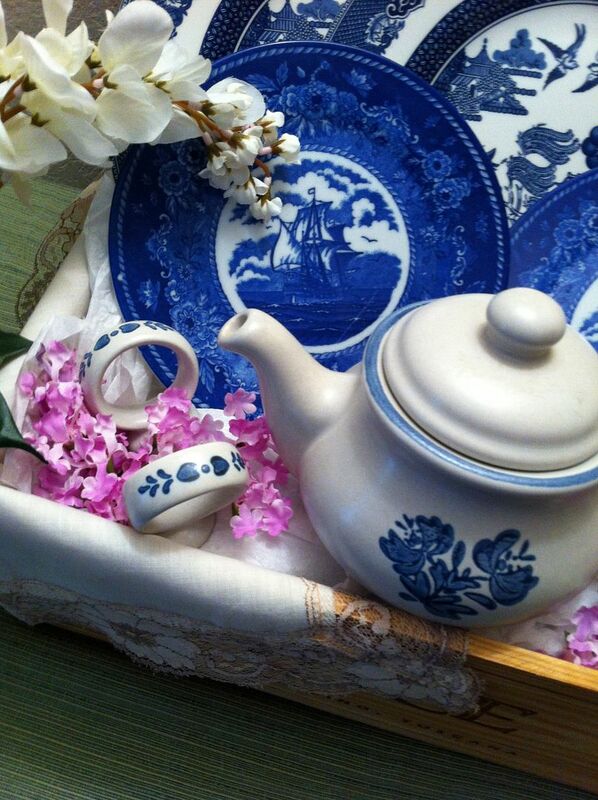 I love the blues, and that teapot is so cute. Hope you have a great day. Great vignette! so neat for Linda to have gifted you these treasures. Happy Birthday Linda. Very pretty. Yes, Linda is one great lady. What an honor for Linda! Your vignette is very pretty! Isn't wonderful to find friends in blogland! Kathe what a great present!! I know Linda must have just loved it. Thanx for partying this week! Lovely! I really like the simplicity of your vignette, and it makes it very striking. Thanks so much for sharing it at Diana Rambles!! So beautiful, Kathe and what a lovely thing to do for Linda :) Thanks so much for sharing at All my Bloggy Friends - I can't wait to see what you share this week! Beautiful! Happy birthday to Linda. Thank you for joining Home Sweet Home.